This post was written in December 2016 and has been updated April 2018. Mexico City is a city with a deep-rooted history, with a cuisine that doesn’t quit, and with an increasingly budding art scene. It’s surrounded by mountains and volcanoes begging to be climbed. It’s full of Aztec ruins and world class museums. There are top ranked restaurants (three of the worlds top 50 are in this city) and street stalls where you’ll eat the best meal of your life. You can travel on a budget or splurge at every corner. Whatever you do, you’ll have an amazing time doing it in Mexico City. I love me a good boutique hotel, and there are many in Mexico City. Two of my absolute favorites are La Palomilla and Chaya B&B. They’re both really well located and close to metro stations. Have a read of my reviews and see for yourself. If you’re going to stay for more than a few nights, I highly recommend checking out AirBnB places in Condesa, Roma, or Polanco. If you’ve never used AirBnB before, you can get $35 off your first booking by signing up with this link. The center of the city is packed with history. 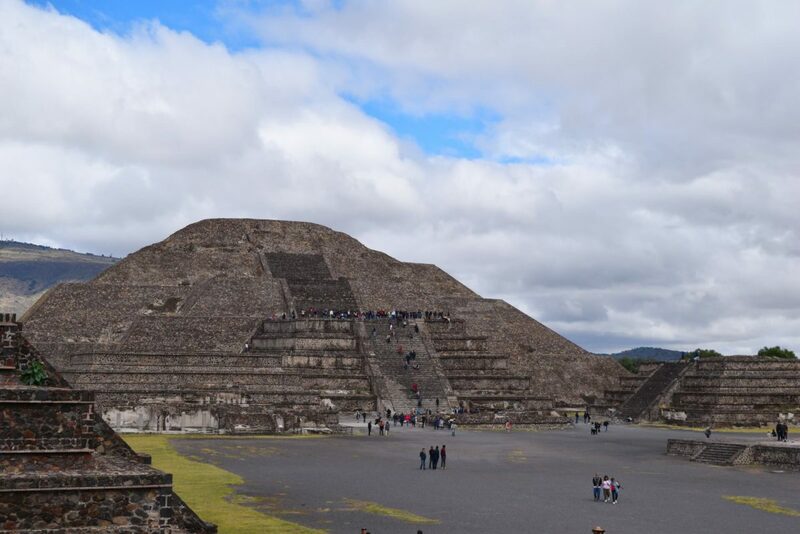 It’s said to have been built on the exact site of the Aztec capital, Tenochtitlán. This is where you’ll find the historical buildings, the museums, and the artifacts that make Mexico City into the metropolis that it is now. Start the day in the Zócalo, the center of the city, in front of the Mexico City Metropolitan Cathedral. The cathedral was first built in 1573. It is the largest cathedral in the Americas and one worth spending a little time exploring, regardless of your religious affiliations. The square is also where they filmed the start of Spectre (the 007 film). Luke always likes to point that out to our visitors! Your next stop should be Palacio Nacional, the National Palace. This is where the original Aztec ruler Moctezuma, had his palace. The inner walls are covered with murals by Diego Rivera, one of Mexico’s most famous painters. The murals depict the history of Mexico City as far back as before the arrival of the Spanish. It’s really beautiful both inside and out. Be sure you have an ID with you (if you don’t have a Mexican-issued ID, then it will need to be a passport). If you want some more Spectre themed sightseeing, head across the Zocalo to the Gran Hotel Ciudad de Mexico. Even if you’re not a huge film buff, the art decor interior is worth a peak. You can go for an overpriced meal or just a beer if you want. For a nearby breakfast spot, check out El Cardinal. It’s well known for its hot chocolate and freshly baked bread like conches. They also make some pretty spectacular chilaquiles – a popular Mexican breakfast food that will keep you full all day long. Next up head west until you reach Palacio de Bellas Artes, the Palace of Fine Arts. It’s the city’s opera house and fine art museum. It’s also my favorite building in the entire city. Check out that colorful dome against the blue sky – SO picturesque! Have a read of the signs to see if there are any shows on. The Folkloric Ballet of Mexico is well worth it if you enjoy live music and want to see some classic Mexican dancing. The costumes are spectacular and the music is really something special. You can usually get a ticket for about 300 pesos ($15). The shows are every Wednesday and Sunday – simply pop into the lobby of the Palace of Fine Arts and head to the ticket counter to get one (they don’t speak much English, but will write down times and point at seats if your Spanish language skills are lacking). For 100 pesos ($5), you can go to the top floor of one of the tallest buildings in Mexico City, Torre Latinoamericana. Luckily once you’re inside you don’t have to look at it and it offers up some of the best views in the city. They give you a map with your ticket so you can see what buildings your looking at. I actually thing going up this building on your first or second day in Mexico City is a great way to really understand how truly massive this city is and to start to see some of the different places that you’re going to check out during the rest of your week in Mexico City. For lunch, I recommend stopping at the market near Hidalgo Metro Station (to the right of the Barrio Alameda building if you’re looking at it). You’ll see tons of red tarps and different vendors selling pambazos, tacos, gorditas, and quesadillas. Pick a busy spot, grab a stool and order a few different things. They’re super cheap and incredibly delicious. If street food isn’t your thing, a great local restaurant to try in the Historic Centro is Cafe de Tacuba. On weekends you may have to wait a few minutes for a table, but for most of the week you’ll get straight in to enjoy great Mexican classic dishes like mole, chile rellenos, and chilaquiles. There’s always live music and the interior is something to behold. They’ve been cooking up dishes in Mexico City at this very location for over 100 years! 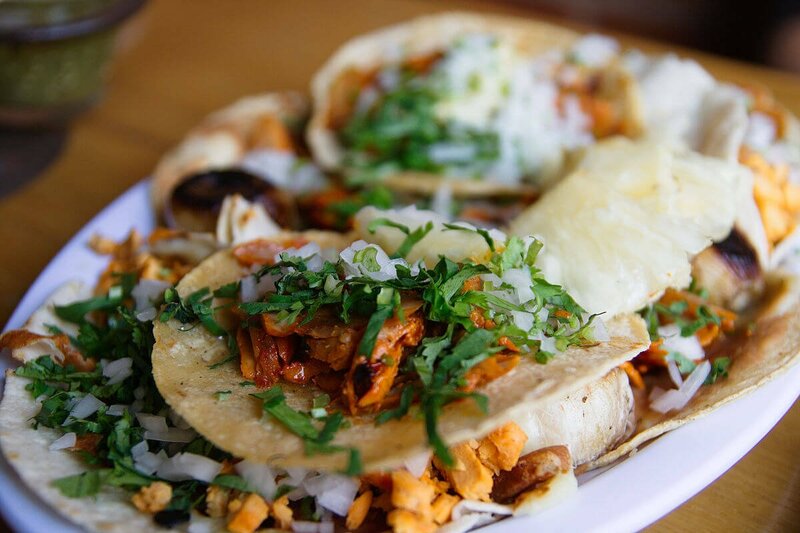 Other worthwhile midday food spots in the Historic Center are El Flaco for “basket tacos,” El Huequito for alambre and pastor tacos, Chilli Aquilli for chilaquiles, and El Pescadito for fish tacos – be sure to try the marlin! These two neighborhoods, which sit side by side, are some of the most livable places in the city. It’s where Luke and I always end up on weekends for their cute cafes, reasonably priced restaurants, and all the craft beer. There are some really great markets in this area as well. One of the best things to do in these neighborhoods is to simply wander. Start at Parque Mexico and head around Avenida Amsterdam (the ring road that circles Condesa). This is where you should have lunch and a coffee (or beer). I love coffee from Frëims, lunch from Tea Connection and churros at El Moro. Be sure to veer off onto the side streets to enjoy the colonial architecture and the street art. This is where some of the best are hidden. If you keep heading east you’ll cross into Colonia Roma. The main street here is Álvaro Obregon. On Sundays, there’s a market (called a Tianguis) at the small park, Parque Pushkin, at the end of the road. Get the Barbacoa (slow cooked goat). The street is filled with busy restaurants and cafes to enjoy during the day and some really great bars at night. Great cafes in Roma to try are Delirio and Dosis. Try the pastor tacos at Tacos Alvaro Obregon (this is my favorite spot to eat them!) or have chicharron tacos at Tacos Orinoco. El Palenquito is a good spot to sample different types of mezcal and Limantour is THE place to go for cocktails – it’s currently ranked the #1 bar in Latin America and #13 in the world! 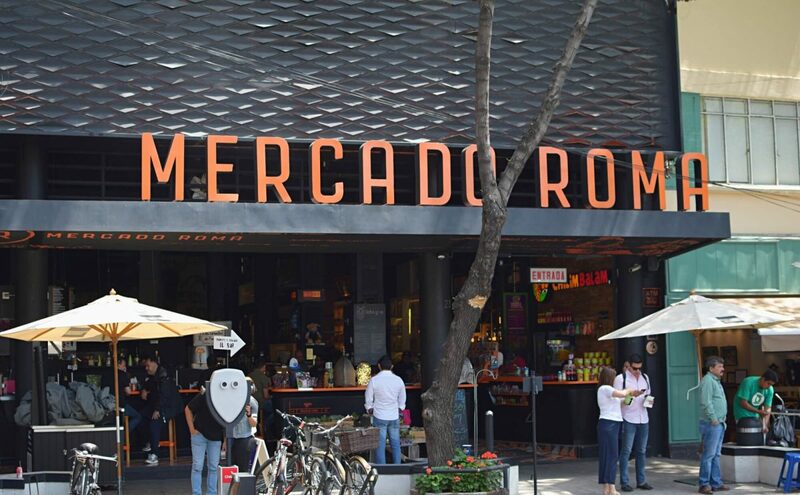 To experience a local Mexican market, head down Medellín or Monterrey Streets until you reach Mercado Medellín. You can get fresh fruit, flowers, homemade furniture, and more great antojitos. Don’t forget to try some Horchata, a drink made with either rice or oatmeal and topped with a hefty scoop of cinnamon. It is super delicious on a hot day. Roma is also a great place to explore the local art scene. It’s packed with galleries like Galería OMR, TOCA Galeria, and the colorful Fifty 24MX Gallery. If you’re ever stumped for a place to eat, both day or night, simply head into these neighborhoods and you won’t be disappointed. Try some of the street vendors, you won’t be disappointed. After dark, most cluster around Avenida de los Insurgentes. Coyoacan is by far my favorite neighborhood in Mexico City and one that cannot be missed. It has amazing street food, my favorite cafes, and really hip craft beer and mezcal bars. 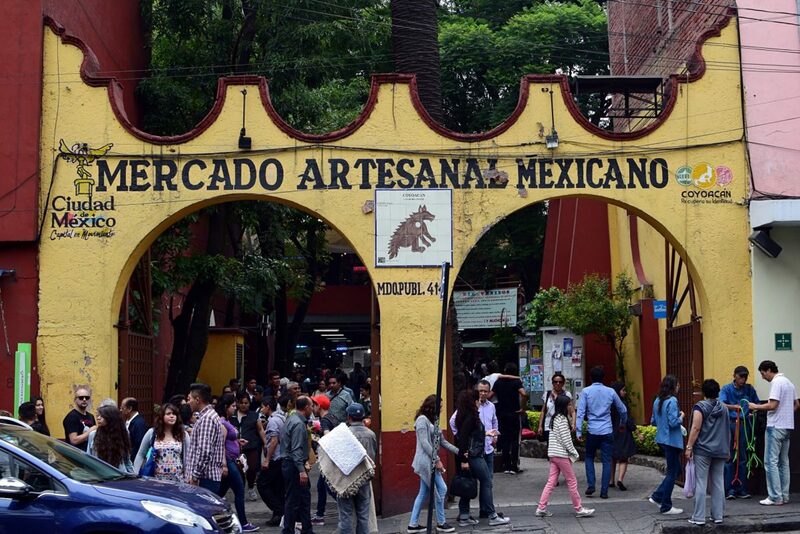 Things not to miss: The Frida Kahlo Museum, Mercado Artesenal Mexicano, tostadas at Mercado Coyoacan and fried quesadillas at Mercado de Antojitos. It feels a world away from central Mexico City. The streets are cobbled, lined with trees, and full of historic churches and homes. If you’re interested in learning more about the legendary Frida Kahlo (you will be after seeing her all over the city), start your day at La Casa Azul, the blue house. This is the where Frida Kahlo was born and raised (and even died!) and is now a museum commemorating her life. You can see things that used to belong to her – jewelry, clothing, artwork. There is also a collection of pre-hispanic art on display. Book your tickets online before you arrive so that you can skip the line. A few blocks from La Casa Azul is the central square, Plaza Hidalgo. This is a really nice park to just relax and people watch in. Restaurants and bars line the square and all offer plenty of outdoor seating. Beside the square is arguably the best market in the city (it’s one of my favorites for sure!). It’s called Mercado Artesanal Mexicano, and it has so many Mexican souvenirs and crafts inside. It’s two floors and is packed with bright colors, strong smells and, on weekends, tons of people. I don’t think I’ve ever gone there without buying something. Have coffee at Café Avellaneda, a beer at Centenario 107, and tostadas in the Coyoacan Market (look for the bright yellow tablecloths). To get to Coyoacan from the city center, you can take the metro line 3 to Coyoacán, Viveros, or Miguel Ángel de Quevedo stations. None are particularly central to Coyoacan, so if you don’t mind spending $2-$3, I recommend simply taking a taxi or an Uber (ubers are generally cheaper and safer than city taxis in my experience). 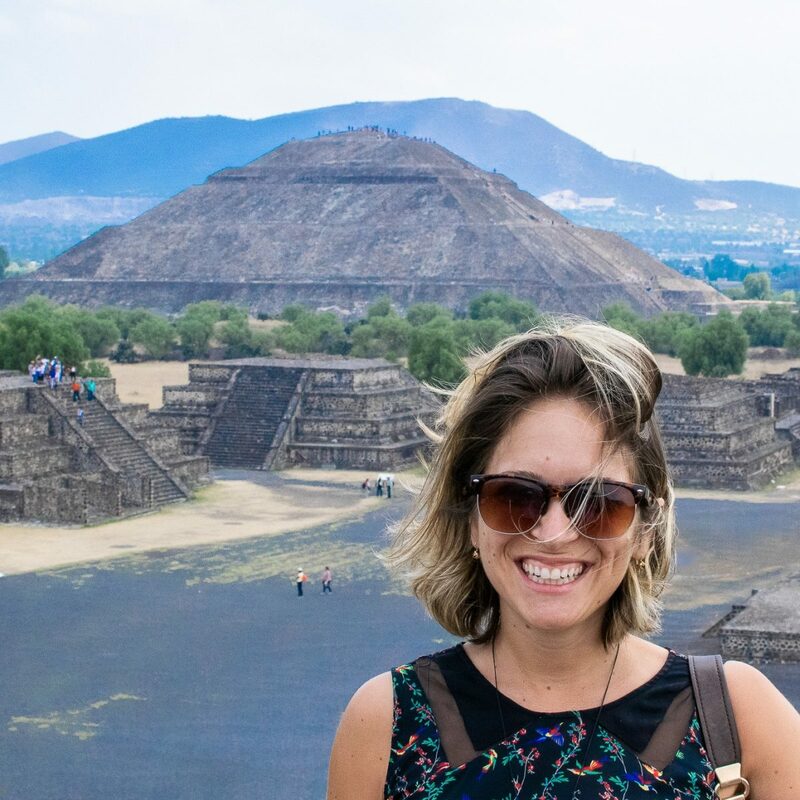 I just wrote about taking a tour of Teotihuacan a few weeks ago. It was such a great experience and the pyramids are incredible. I really recommend taking a tour if you’re only going to be in the city for a few days. They’ll pick you up from your hotel and drop you back off there at the end of the day. They’ll organize a place to have a nice Mexican lunch and ply you with tons of tequila, too! If you do want to go it alone, you can catch a bus from the Northern Bus Terminal, Terminal Autobuses del Norte. Buses labeled Piramides leave every 20 minutes for Teotihuacan and drop you off at the bus terminal there, a five-minute walk to the entrance of the ruins. It takes about an hour to get there. Polanco is the upscale neighborhood in Mexico City. It’s home to the ultra-wealthy, the top hotels and restaurants, tons of museums, and all the designer shopping. Walk down Campos Eliseos. It’s a really beautiful tree-lined street with some of the biggest and fanciest houses in the city. Then head to Parque Lincoln, the unofficial center of the suburb. It has nice walking paths and is a good place to start your stroll around the neighborhood. You’ll hear French, German, and plenty of English in this neighborhood. It’s where a lot of expats live. It’s around this park that you’ll find most of the best midday lunch spots and cafes. One of my favorites is Surtidora Don Batiz. The ceviche here is delicious! If you’re interested in art, you’ll find some of the best galleries and museums in Polanco. Jumex Collection is the city’s most valuable contemporary art collection. Every month or two big-name exhibitions come through. A few months ago I saw a fantastic Andy Warhol exhibit here and the best part is it’s usually totally free! Next door to Jumex Collection is the Museo Soumaya. It was commissioned by one of the richest men in Mexico (and indeed the world), Carlos Slim. The building is really unique and worth a visit even if you don’t go in. It is worth going in though and it’s free every day of the week. On the inside, you’ll find European paintings, pre-hispanic sculptures and ceramics, and ivory from around Asia. If you want to splurge, make a reservation at Pujol for dinner. It’s ranked as one of the top five restaurants in the world. For $80 per person you’ll get a seven-course degustation. I WILL eat here. Other top restaurants in the area worth trying are Quintonil for dinner and Comedor Jacinta for lunch. Xochimilco is an area a few miles south of the city center. It’s best to take a taxi here or speak to your hotel – many hotels offer mini-buses here. You can also do tours here if you’d rather have them organize the whole thing. Olympus Tours have a reasonably priced tour here which I recommend if you don’t speak any Spanish. The three main things to explore in Xochimilco are the Museo Dolores Olmed Patiño, the market, and the main attraction: the floating garden. From here you can either take a bus or a taxi to Mercado de Xochimilco. It’s broken into two areas, Xochitl Zona where you’ll find fruits, vegetables, meats and pottery, and Xochimilco Anexo where you can buy flowers and food. This is a great spot for lunch. The Floating Gardens is a fun both day and night. It’s the main reason most people visit the area, so it can get very busy, especially on weekends. Busy is good though, it makes for a great atmosphere. I love it most on a sunny Sunday afternoon. Head to a boat landing (embarcadero) where someone will help you arrange a boat ride. The main embarcadero is the Nueva Nativitas which is where you should head to get the best price. You pay by the hour to take a boat ride (not per person, but per boat) and it shouldn’t cost more than 350 pesos per hour. Don’t head for the boats that say 20 pesos, those are taxis, not pleasure cruises. Pack a few drinks, snacks, and speakers for music if you want! Anything goes. Other boats will float up to yours touting food, drinks, and mariachi bands. It’s a really fun atmosphere but can feel slightly overwhelming at first. You’ve been warned! 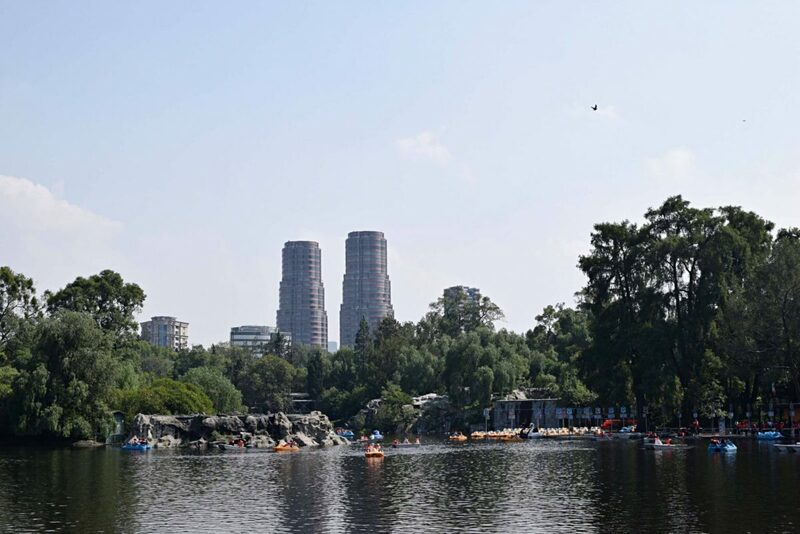 Chapultepec is one of my favorite places to get away from the noise and craziness of the city. It’s absolutely enormous. There are tons of entrances along Paseo de la Reforma depending on where you want to start. In the park, you’ll find Castillo de Chapultepec, the castle on the hill. Fun fact – it’s the only castle in North America that has actually had royalty live in it! From here you can walk through the main path lined on both sides with vendors. It will lead you to the lake where you can rent a paddle boat for a few dollars an hour. It’s a fun way to spend a sunny afternoon and you can see a different view of the park this way. If it’s a sunny day, try out one of the paddle boats on the lake. It’s really cheap – only 50 pesos for an hour ($2.50). There are tons of places to try Mexican snacks and antojitos. Definitely have some Chicharron (fried pig skin) with all the toppings! Now Get Yourself to Mexico City! What did I miss? What are some other things you want to know about Mexico City? Let me know in the comments! Mexico City sounds amazing — and the food looks delicious! Great guide! It’s such an amazing country – the food is the best! Thanks so much, Selina! Mexico City is such a great city! Been dying to go to DF! Hopefully I can make it in 2017! That would be great – feel free to get in touch I’d love to tell you more about it! Dear Laura, I am thinking about going to México this upcoming May. Have you heard about Hotel Catedral? Would you recommend it? I was literally just doing some research on Mexico City for my future travels there and then I saw your post on the Female Travel Bloggers Facebook group! 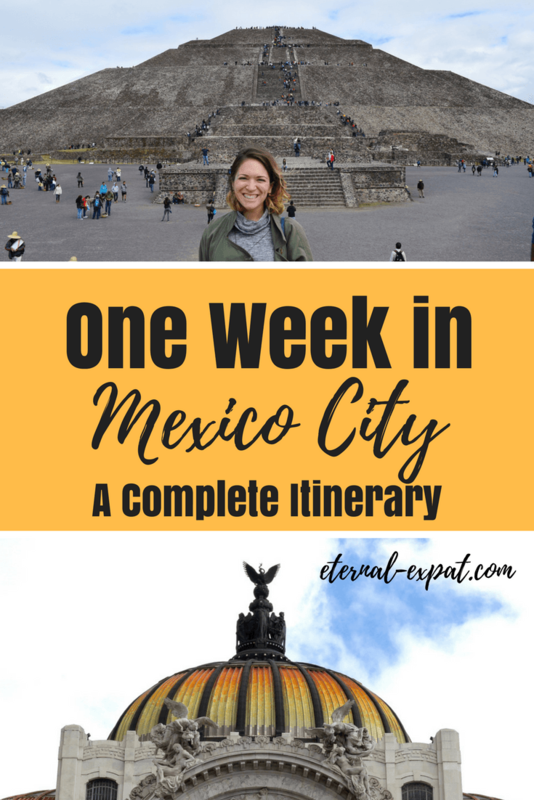 This is a really great itinerary with lots of detail and tips for visiting the best of Mexico City. I will definitely be bookmarking this post and referring to it again when I get more serious about planning my trip there. That’s awesome Brittany! I’m so glad it’s helpful for you! Definitely get in touch when you start planning more seriously! I’d love to help! Thanks for the awesome post! We’re heading to Mexico City tomorrow for exactly one week and really appreciate the tips. I’d add one to the list even before we do it – catch lucha libre at Arena Mexico. We’ve got tickets for Friday night and I’m super excited about it. We’ll definitely try to hit a lot of the places you recommend. As we’re sort-of moving to Mexico, we’re just doing research at the moment and trying to see as much as we can in all of the places we might like to live. Will definitely be checking your blog more in the near future! Muchas gracias! Awesome! I haven’t made it to a Lucha Libre yet myself – my Mexican friends all scoff when I tell them I want to go. They say it’s worse than WWE! haha Would love to know what you thought of it? Thanks so much for these tips! I’m looking forward to exploring this amazing city!